Every couple of years we come up with a theme here at Tech Soft 3D. We do this to help us focus on something that is particularly important for us to pay special attention to at a point in time as we grow. We do this because it helps us to strengthen some ‘organizational muscles’ that we will be exercising extensively during this next growth phase. In 1996, it would have been impossible to imagine that 20 years later I would be sitting here writing this particular blog. 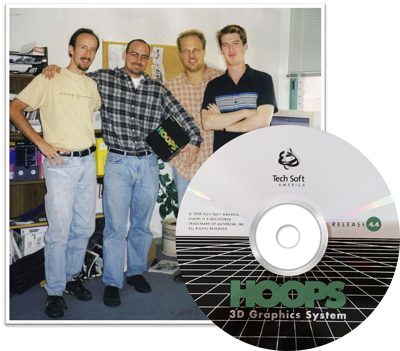 At the time, when Gavin, Yanick, Rob and I spun the HOOPS Visualize technology out of Autodesk, we could hardly have been a more scrappy, scruffy start-up. We had no funding, were squatting in Autodesk offices, had no clear idea of how to run a company and certainly no clear idea of how we would grow over the long-term. We did know that there were customers relying on the HOOPS technology and we were determined to take care of them as job #1. Beyond that, I suppose like any start-up, we were hoping to survive long enough to not only support those partners, but also to eventually fuel innovation for many more development teams. I feel like talking about culture. Well, not culture exactly, but more about the stuff that often passes for culture these days. No, this blog isn’t about shoes, but I do think they provide a useful metaphor. This blog is about ‘fit’. Whether or not someone is a ‘cultural fit’ is often talked about as being important. Those who say that are wrong. It’s not important. It’s absolutely vital! So where do the shoes come in? Stick with me. Feet = your company culture. When we interview someone for a position, it’s like going to a shoe store and trying on shoes. I’m looking for some dress shoes with particular qualities (resume review process), so I can walk right past the sandals, running shoes and snow boots. OK, I’m now looking at the dress shoes and find a style I like, discovering they only have a few options in my particular size (I’ve now winnowed it down to the serious interviewees). I then try on a couple of pairs and walk around the store for a few minutes (the interview process). The shoes address my needs and seem to fit fine, so I buy the pair I like best and walk out (they’re hired). When I wear the shoes to work for the first time they hurt a bit at first, but I figure they’ll break in. However, I quickly discover that I need to wear those shoes every week for 40+ hours, so the little bit of tightness that seemed OK walking up and down the aisle in the store is causing me all sorts of pain – blisters, squished toes, etc. But it’s not just me. In a sense, everyone working with those shoes is walking around in them all day, every day. Then to make matters worse, sometimes things get intense at work – so you have to run a mile or so in those shoes. Ouch! You try all sort of things to make the shoes fit better to reduce the pain, but no amount of lotion, band-aids or changing socks is going to make those shoes fit. Just admit it. These shoes don’t fit. I suspect very few people stop to think about this story from the shoe’s perspective. If the shoe doesn’t fit your feet, you can bet your feet don’t fit that shoe. The poor shoe, who started out its life with you with such good intentions and high hopes, is trying its best to change shape. It knows it’s causing you blisters and it’s suffering too. It’s trying to stop the rubbing, but to no avail. To be clear, there’s nothing wrong with the shoes. They’re a good, quality brand and on the right set of feet, they’d be fantastic. But for your particular feet they can’t help it. They just rub and squeeze and scrape and it’s as painful for the shoes as it is for your feet. In the end all you can do is stop wearing those shoes. Your feet aren’t going to change shape and neither are the shoes. The sooner you accept that, the better. A clever metaphor, perhaps, but what to do about it? First, take a longer walk in those shoes before you swipe your credit card, tuck the box under your arm and congratulate yourself for getting that shoe-shopping task scratched off of your to-do list. You’ll be living with those shoes a long time, so the more chance you give your feet to decide if those shoes fit, the better. Walk as long as the store manager will let you – around the block. Up a hill. Up and down the stairs. Try to work through something with the candidate. If at all possible, have them do a project for you on a consulting basis. Basically, if the store will allow it, try renting the shoes for a little while before committing to buy. Second, know that what seems like just a little bit of a poor fit during your walk around the store will inevitably magnify into incredibly painful feet later. Don't delude yourself into thinking that with a little bit of stretching the shoes will be ‘broken in’ and eventually conform to your feet. They won’t. It will only get worse, so if you feel they may not fit when you are in the store, put them back on the shelf and keep looking. And in the end, know there is no value judgment for shoes that don’t fit. Your feet don't fit those shoes just as much as those shoes don’t fit your feet. Those shoes will eventually find the feet that are just right for them and you should keep searching for the shoes that are just right for you. In my last two blogs, I talked about the lessons we learned and the upsides we experienced as a result of our Tetra4D acquisition. I’d like to complete the series by sharing how the act of contemplating that acquisition also pushed us to expand our mission.